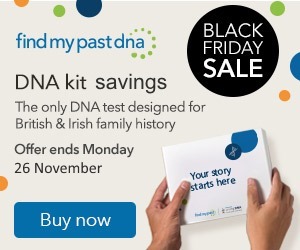 Making its Black Friday/Cyber Monday debut, FindMyPast DNA is offering Living DNA test kits at their lowest ever prices, PLUS, if you're a new or returning Findmypast customer, you’ll receive a complimentary 14-day subscription to FindMyPast's entire archive of 9 billion records and historical newspapers when you activate your kit. FindMyPast DNA is a collaboration between the two British companies. Living DNA's test breaks down a person's heritage into 21 specific British and Irish regions and helps users to build a colourful picture of their roots. With the test kit price reduced from €89 to €69, researchers in Ireland save €20. Offer ends at 11:59pm GMT on Monday 26 November. With the test kit price reduced from £79 to £59, UK-based researchers save £20. The offer will expire at 11:59pm GMT on Monday 26 November. Researchers in the USA save $30. Price reduced from US$89 to US$59. Offer ends 11:59pm PST on Monday 26 November. Canadian researchers can save CA$20. The price of the test kit is reduced from CA$99 to CA$79. Discount expires at 11:59pm PST on Monday 26 November. Researchers based in Australia and New Zealand can save $30, with the price reduced from AUS$/NZ$129 to AUS$/NZ$99. Offer expires at 11:59pm AEDT on Monday 26 November.